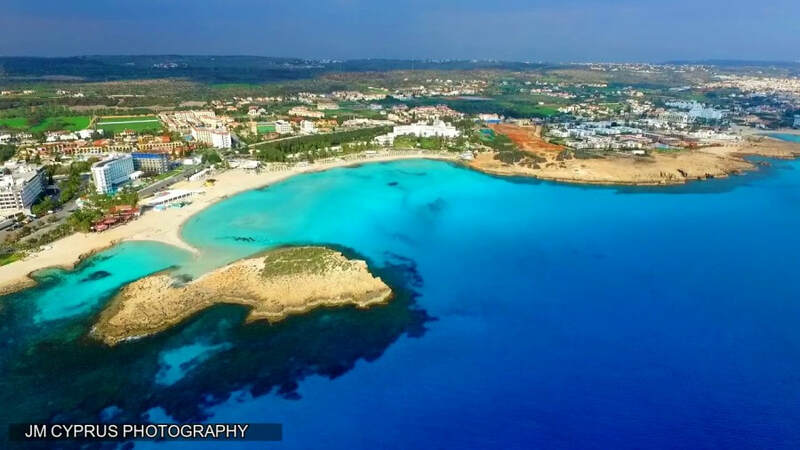 Nissi Bay is the area in the western part of Ayia Napa and is made up of the beach areas of Macronissos Beach, Landa Beach, Nissi Beach and Sandy bay. 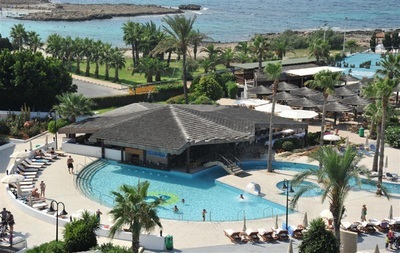 Many holiday companies are now separating Nissi Bay from Ayia Napa and selling it as a separate resort. 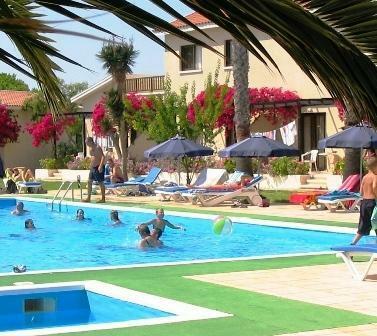 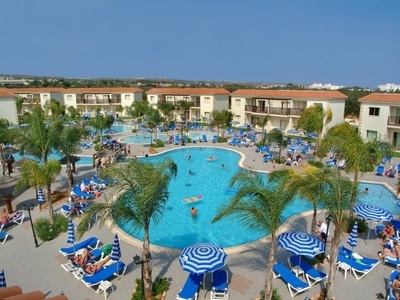 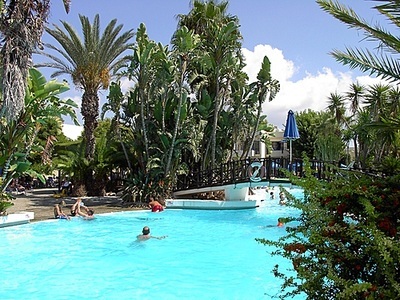 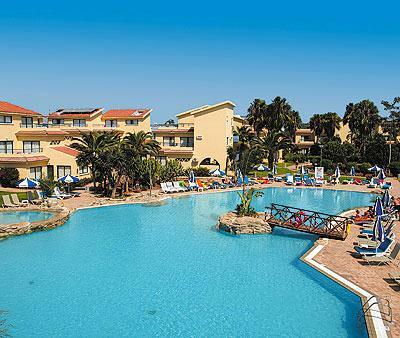 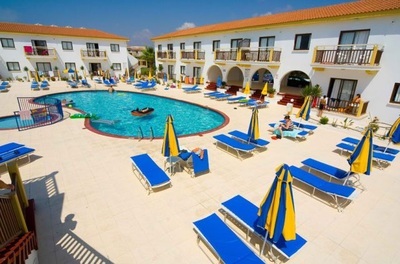 It is actually part of Ayia Napa, although it is a couple of miles away from the town centre, and is generally a peaceful and relaxing area with countryside and sea views. 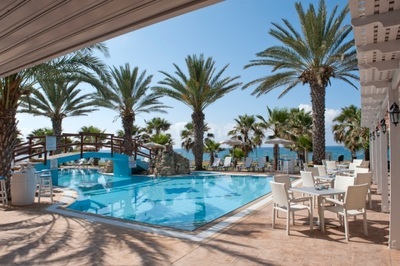 As well as boasting some of the best beaches in Cyprus, Nissi Bay has a few restaurants and a handful of family friendly bars. 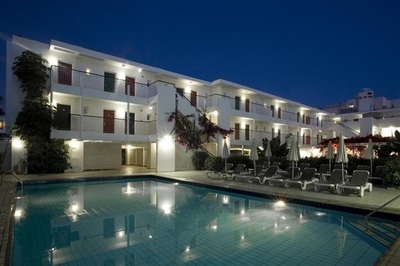 This area is very quiet at night time and with the exception of Nissi Beach, daytimes are also quite sleepy and chilled out. 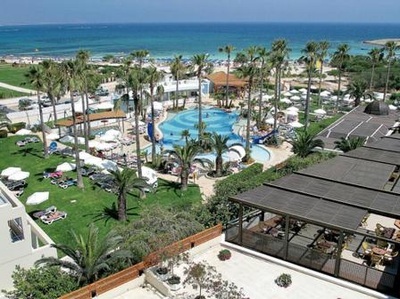 Nissi Beach itself is a hotspot for daytime beach parties with DJ's and foam parties daily through the summer months. 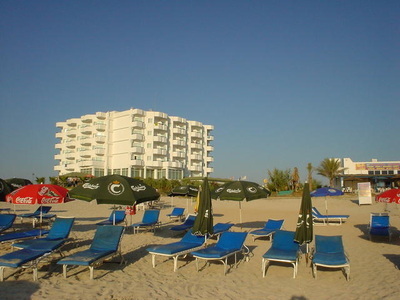 The rest of the beaches in this area tend to be quieter although still busy in peak season. 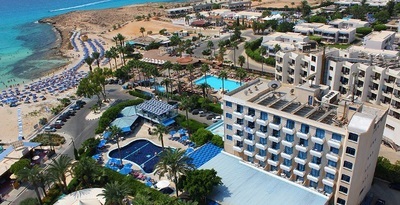 Read more about Nissi Bay. 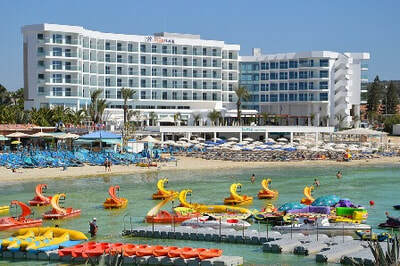 Nissi Bay has a lot of high quality hotels and this area is the best choice for a 4 star+ beachfront hotel in Ayia Napa. 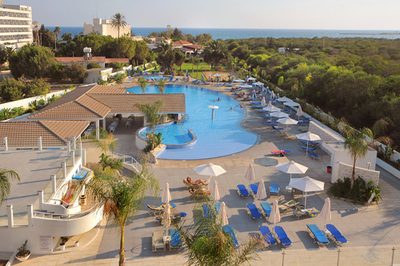 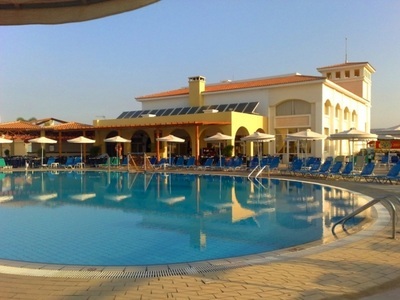 Beachfront hotels include Dome Beach, Asterias Beach, So Nice, Olympic Bay, Adams Beach, Vassos Nissi Plage, Nissi Beach Resort, Pavlonapa, Anonymous Beach and Tasia Maris Beach. 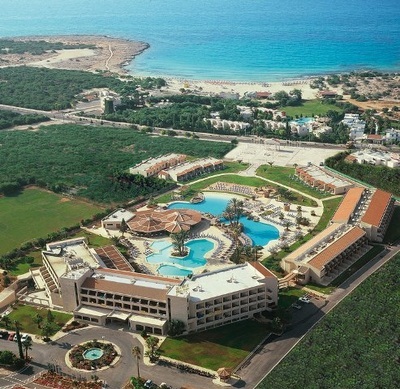 Nissi Bay can be split into four beach areas, Sandy Bay, Nissi Beach, Landa Beach and Macronissos. 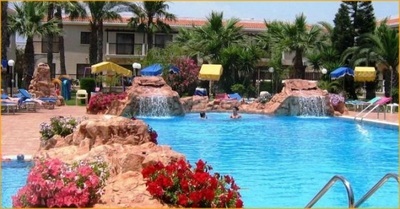 Each area has a selection of hotels and apartments. 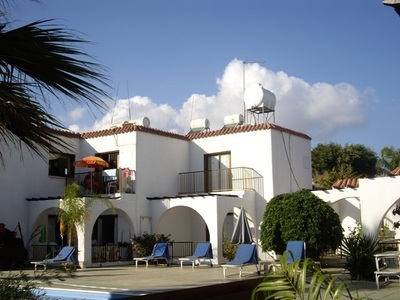 Many are beachfront or just a few minutes walk from the beach. 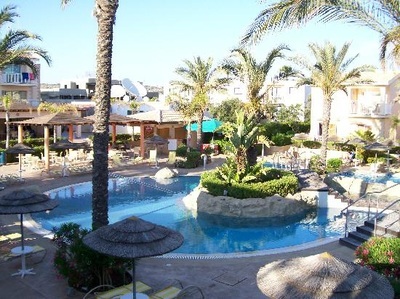 Each area also has a handful of bars and restaurants. 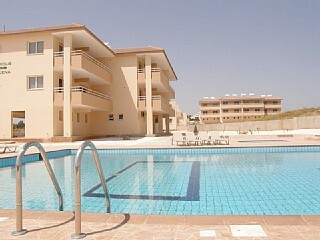 The further from town you go the quieter it is and the less amenities there are. 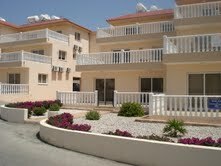 Sandy Bay is only 20 minutes from the town centre and Nissi Beach 30 minutes walk. 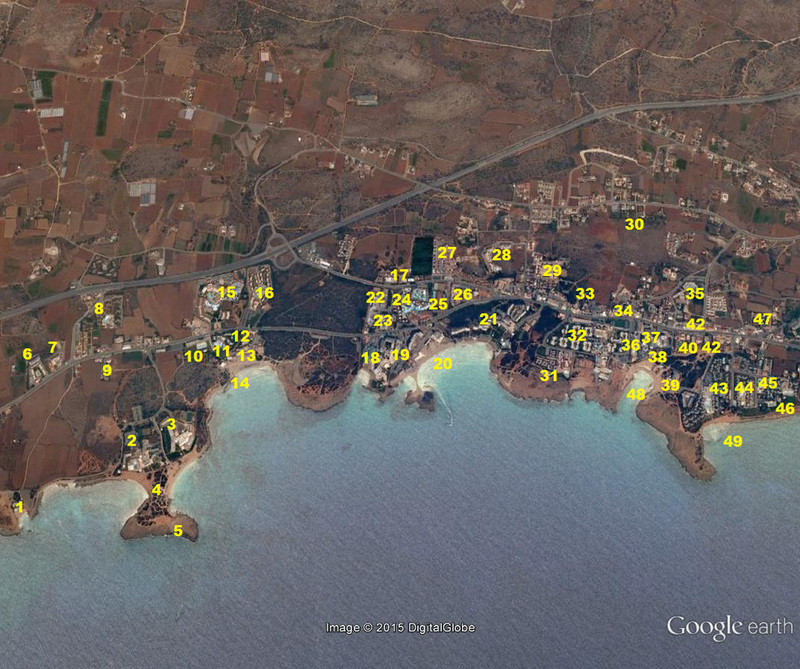 Landa and Macronissos are further. 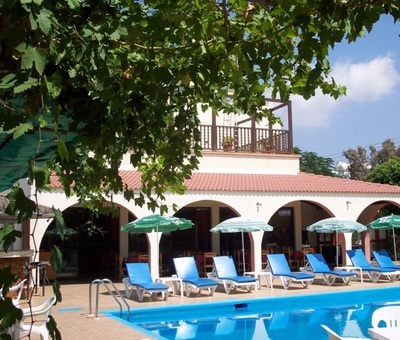 Hotels at Sandy Bay include Tasia Maris Gardens, Tasia Maris Sands, Tasia Maris Beach, Christophers Beach Suites, Pavlonapa, Anonymous Beach, Sunwing Sandy Bay and Florence apartments. 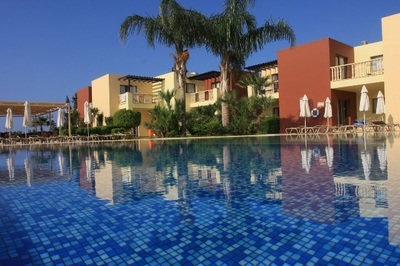 Hotels at Nissi Beach include Nissi Beach Resort, Vassos Nissi Plage, Adams Beach, Nissi Park, Nissiana, Aeneas Resort, Napasol and Christofinia. 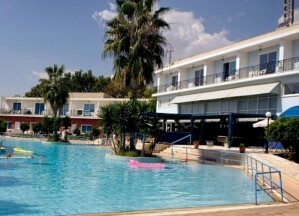 Hotels at Landa Beach include So Nice Suites, Olympic Bay, Tsokkos Paradise, Olympic Lagoon, So White Suites. 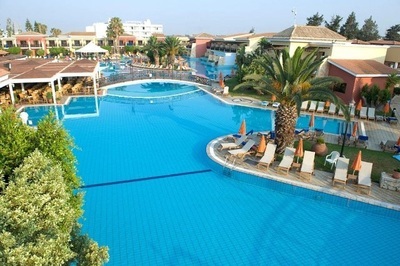 Hotels at Macronissos Beach include Mon Repos, Macronissos Village, Asterias Beach, Dome Beach, Cosmelenia and Loutsiana. 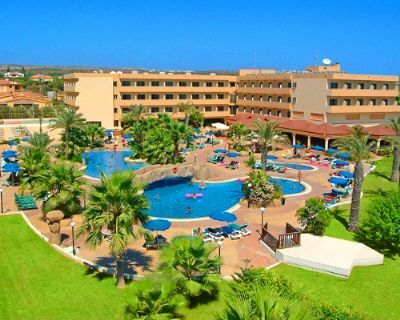 Please click through to each hotels information page for pictures, maps, hotel descriptions and how to book.